Trimming hedges is one of the more difficult forms of garden maintenance - especially when they reach heights that make it impossible to do without equipment. High hedges certainly offer many benefits, but easy maintenance is not one of them, which is why so many opt to hire a professional gardener to do the job. Even professional gardeners will struggle to efficiently maintain high hedges without the necessary equipment, which is why so many opt for a hedge cutting platform. These products offer a more robust and reliable platform to cut hedges compared to traditional ladders, so if your garden is home to many high hedges they are very-much a worthwhile investment. Also, it’s much safer to use an appropriate hedge cutting platform for your garden maintenance. High hedges aren’t just challenging to trim, they can be quite dangerous if approached incorrectly, so it’s important to get a product that allows you to reach the ideal cutting heights and distances. Better still, a hedge cutting platform offers a versatile piece of equipment that can be used throughout your garden - and even inside the home too! From pruning trees to cleaning windows, there’s no shortage of tasks that aren’t made easier with a quality hedge cutting platform! Of course, different sizes of hedges require different types of platforms, and thankfully there are many great options to choose from. Beyond offering a suitable height for cutting, other things to look for include portability, stability, and easy assembly. Check out some great hedge cutting platforms below! 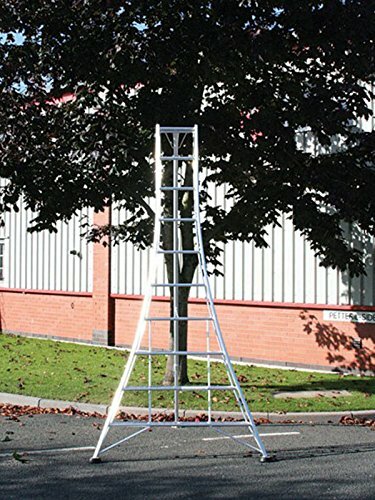 This garden tripod ladder is a great choice for hedge trimming, thanks in no part to its impressive 3m height that makes it ideal for most hedges and tree pruning. While it looks like a traditional ladder, the option of a third leg makes it invaluable for dealing with uneven ground found in many gardens. If you’re struggling to find stability with two legs, simply pull out the third telescopic leg and place it to a suitable position on the ground. Quick and easy to use, it ensures you can trim hedges and trees while also getting to use the traditional ladder for other routine maintenance. Made from aluminium, the ladder is lightweight so very easy to manoeuvre, yet strong enough to provide reliable support for weights up to 100kg. The support is enhanced by the clawed feet design, which dig into to the uneven surfaces found on lawns and soil, while rubber caps can be attached when using on smooth surfaces such as indoors. A versatile ladder, this is a great hedge cutting platform and much more! This 10 Rung Combi All-In-One Extension Ladder offers everything you could need in a ladder - because it’s actually several ladders in one! This versatility means that it’s not just great for hedge trimming and garden maintenance, but for virtually anything that requires a ladder! For example, the top height of the ladder when fully extended is a whopping 6.26m! 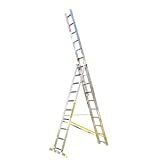 This is ideal for reaching most roofs, while you can lower this height for smaller areas, making it a great extension ladder for using throughout the home. The free-standing design is perhaps the best for hedge trimming. The main reason for this is that it removes the need to lean against the hedge or tree, which is the only option with extension ladders -thankfully this switches between both! This design is also great for decorating high ceilings, while it also can be adjusted into a double-sided step ladder - you’re essentially getting multiple ladders for the price of one! The Niwaki 12’ Tripod Ladder is another great choice for hedge trimming. While offering no platform so to speak, the tripod design makes it completely safe to use for hedge trimming and tree pruning. This is because the third leg can be used to help offer a stable balance on uneven terrain. Extension and double-sided ladders are quite dangerous to use for this as they don’t quite have the right balance for the job while also forcing you to over extend which can be quite hazardous. Using the Niwaki, expect to be safe and secure even if need to work on hedges that are situated on a slope. Plus, the third leg can be put away when not needed, allowing the ladder to double up as a standard single ladder - perfect for routine maintenance throughout the home! The Major Hi-Steps Aluminium Garden Ladder from Henchman is a fantastic platform for cutting hedges. With a sizeable height of 3.1m for the platform, you can safely reach out to trim even the highest hedges with ease. Using the traditional A-shape design found on double-sided ladders, the included platform offers a much more stable location to conduct your hedge trimming and other maintenance. It’s a lot more reliable than a normal ladder, given more space to manoeuvre and a place to safely lay down your tools. Better still, the platform comes with an enclosure to protect you from accidentally overextending yourself, making it one of the safer hedge trimming platforms out there. Splayed feet ensure a stable ladder on uneven surfaces too, also absorbing the weight should you lean forwards. Not only is the Lyte 5 Way Platform a great hedge trimming platform, it’s a selection of ladders that can be used for virtually any DIY task! The platform itself is an impressive size, featuring a nonslip surface and handrails for added safety. Simply use the two single ladders as a scaffolding base, attach the platform and you are good to go! The top height you can get with the platform attached is around 1.6m, and this can be lowered to various rungs for a different height if necessary. Each single ladder can be used too, while attaching them end to end provides both an extension ladder and a double-sided step ladder, so it’s certainly one of the most versatile platform-ladder combos out there! Read our other guides on garden cutting tools on hedge trimmers, loppers, secateurs and garden hedge shears.